Longrun N Jade's Party Of One - growing up and getting around! We're assembling quite a collection of "Solo snoozing" photos. He's just so cute; what can I say? Here he is at two days shy of fifteen weeks, all cozy with his mama, Dena. Stacking practice at seventeen weeks. Solo's thinking, "Can't you just give me the chicken; why do I have to stand still? I have stuff to do!" Empty? Oh, no! 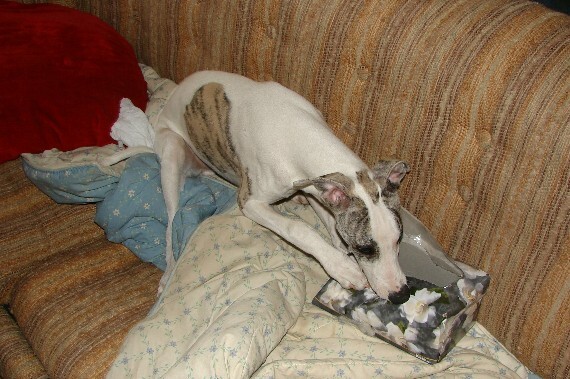 I think I'm sitting on the last tissue! I hope no one needs to blow their nose. 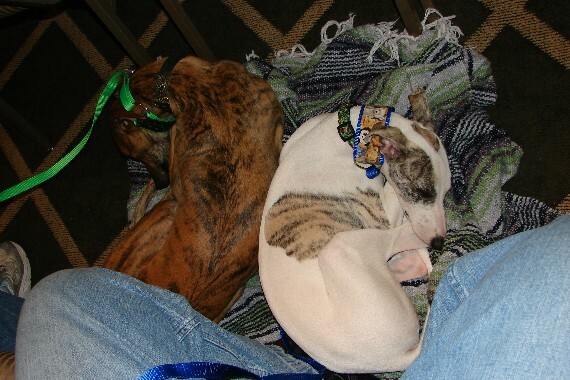 Here are Solo and Hugo enjoying the 2007 AWC National Specialty from their ring-side blanky. 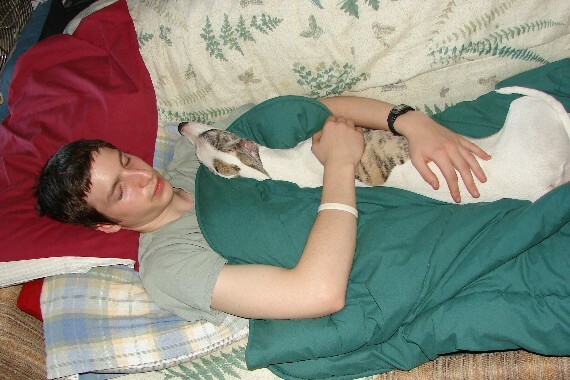 Do you think travelling and hanging around hundreds of other whippets stressed out our little pup at the tender age of four and a half months? I don't THINK so! He had a wonderful time making friends and washing faces at the Nat, and he was a very good boy! 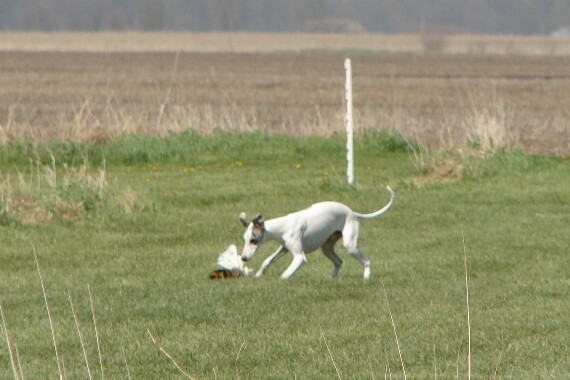 It's a bit blurry, but I love this shot of Solo (one day short of five months) pouncing on the "bunny" at a race practice. 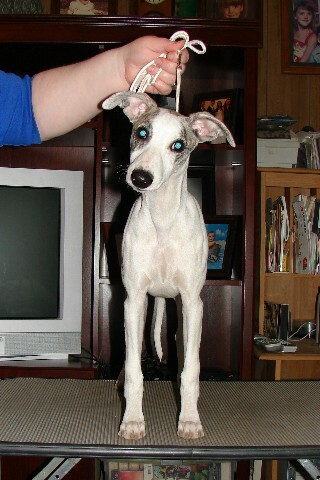 He's all whippet! 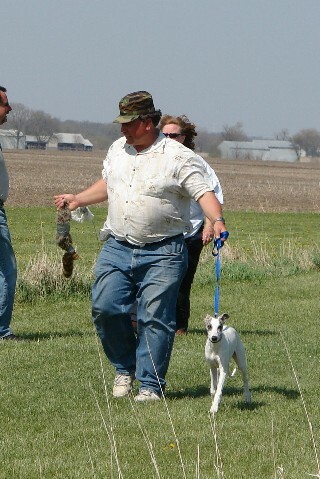 At right is a very proud Solo, future race dog, walking the bunny back up with Bill, who is also very proud. 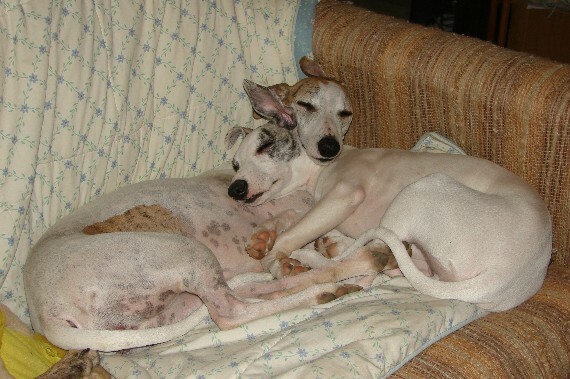 Solo is a wonderful young whippet, and a perfect addition to our little pack. 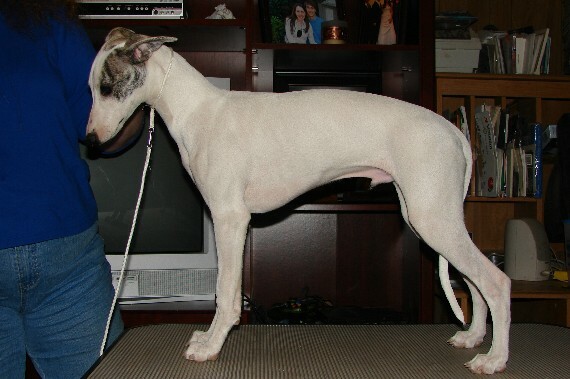 We are looking forward to his show ring debut at the end of May - it's going to be so much fun! A circus is fun, isn't it? Anyone for a mouth wrestle? 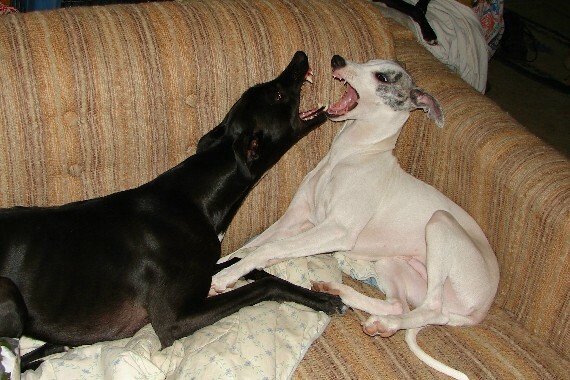 Look at Solo the snaggletoothed whippet! He was in the process of losing baby teeth and getting adult teeth, and his smile had some spaces. Don't he and cousin Starman look fearsome? Sweet, snuggly Solo, helping a sick Klaus feel better.